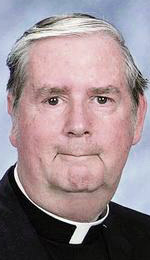 Father James W. Donlon, 79, pastor emeritus of St. Matthew Parish, Conshohocken, died May 6. Born in Philadelphia, the son of the late Frank J. and the late Clare (Lynch) Donlon, he attended St. Francis Xavier School and Roman Catholic High School before entering St. Charles Borromeo Seminary. He was ordained May 22, 1965 at the Cathedral Basilica of SS. Peter and Paul by then-Archbishop John J. Krol and his first assignment was as parochial vicar at Assumption B.V.M. Parish, Feasterville. He also served at St. Andrew, Drexel Hill; St. Francis of Assisi, Norristown; St. Anne, Philadelphia; St. Joseph, Collingdale and Stella Maris, Philadelphia. In 1989 he was appointed pastor of St. Matthew where he served for 22 years before being named pastor emeritus in 2011. In retirement he lived for a time at Nativity B.V.M., Media, where he kept his hand in ministry. St. Joseph Sister Regina Dougherty remembers well how Father Donlon would stand behind the school every day and greet every parent, every teacher and every child as they went by. His homilies were always short but to the point, Sister Regina recalls, maybe two minutes on a weekday and five minutes on Sunday, but there were always three practical applications that when the people left they could take with them. In addition to that, she recalls his foresight in making the necessary improvements to the parish buildings before there was a problem. Harry Collins, a convert to Catholicism, credits a good part of his faith journey to Father Donlon. He was a life-long Christian, but not happy in his denomination. He toyed with the idea of becoming Catholic for years. His wife was Catholic and he’d been married at St. Matthew’s 51 years ago, but he was uncertain. He tried the RCIA program but wasn’t comfortable with the initial group he joined. It was Father Donlon who talked him into trying again the next year and it worked. He was received into the church in 1996, and has been an active member, including at this time a lector. “Father Donlon was really instrumental for me, and he was a wonderful, wonderful priest,” he said. The Reception of the Body of Father Donlon will be held at St. Matthew Church on Tuesday, May 12 at 9 a.m., followed by a viewing. Bishop Michael Fitzgerald will be the principal celebrant of his 11 a.m. funeral Mass. Concelebrants will include Fathers Anthony J. DiGuglielmo, Thomas J. Duffy, and St. Matthew’s current pastor, J. Thomas Heron, and Father Bell, who will be the homilist. Father Donlon is survived by cousins. Interment will be at Calvary Cemetery, West Conshohocken.